With rapidly developed economy in recent years, high-tech products bring the new opportunity for all industries. In order to increase the work efficiency and improve the management, director of many industries are using the new technology to make a great benefit in the fastest way. This project is designed for a 1kmzlarge farm, which produces agricultural and sideline products with high quality. Raising live-bird and pond farming. This farm is under half opening administration, with a large area and planting a lot of crops, the safety of property is difficult to control if using artificial management for everything. There are two reasons that the farm owner decided to use wireless surveillance system for monitoring and managing the whole farm. First is to ensure the safety of property and avoid any unnecessary damage. Second is for security of tourist as there are fishpond in the farm and terrain environment is complicated. ·There are mountains between the monitor center and all areas of the farm, impossible to install wired connection because of the terrain environment. ·Except areas No.8 and No.9 of the farm, there are jungles and obstacles among other areas and monitor center. ·The shortest distance between each area is 300 meters, the longest distance is 1.5 kilometers. 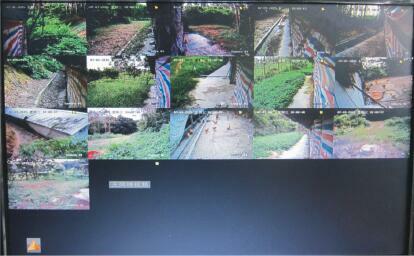 It is better to use wireless surveillance system. ·There are three 720P cameras in each area. bandwidth is around 3-4M. ·Make ensure all cameras can run stably in a long term, and the surveillance video should be smoothly. ·Make ensure the confidentiality of video information. 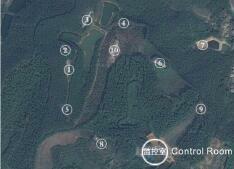 Because there are many obstacles between monitor center and areas of the farm, except areas No.8 and No.9. Therefore, we can’t use point to point wireless transmission for surveillance system in this project. Area No.10 is the highest point of all areas of the farm in the satellite map, which means area No.10 is visible with other areas. Therefore, we use area No.10 as wireless repeater to transmit surveillance video from areas to monitor center. DIP356-H is suitable for this project. It is with high transmitting power, transmitting surveillance video in a long distance. We set the transmitter at the roof of monitor center, and set the receiver at the area No.10. Because DIP356一 H can achieve wireless transmission by switching the buttons, it can save some labor for the whole project. It only can use wireless system, because the environment is complicated and there are many obstacles between the distance from monitor center to area No.10. The distance between monitor center and area No.10 brings a big trouble, because it is long and invisible. After adjusting the transmitting angle several times, we achieve wireless transmission at a high location at the final, the transmission is stable and fast. Because monitor center and area No.10 achieve wireless transmission, we set three wireless repeaters in area No.10 for transmitting data to other areas by point to multipoints mode. Because DIP356-H is 5.8GHz with high transmitting power, we use this item to build up the wireless system for ensuring the video quality. to two points module for transmission via repeater, each link with six 720P cameras. Building up wireless system by setting multiple monitoring points can monitor the farm by clear surveillance pictures. Monitor staff can know each area well and react to the emergency at the beginning. It increases work efficiency and security assurance of the farm.